The stories of Dr. Seuss are among the familiar, much loved staples of childhood reading for countless children around the world. Filled with clever rhymes, fantasy and wonder, these classic stories have entertained and inspired generations of children, and it’s not surprising that someone eventually had the idea to adapt them into a musical. The latest entry in the Muny’s current season, Seussical is a show that’s full of rhyme, song and whimsical flights of fancy, cast with a strong lineup of Muny veterans that bring the classic tales to life in a gentle fashion that seems designed to appeal most to the youngest members of the Muny audience. Paying musical tribute to the various works of the esteemed Dr. Seuss, this show focuses primarily on the Horton the Elephant stories, with elements from many other Seuss tales thrown in here and there. Narrated by the illustrious Cat in the Hat (John Tartaglia), the story begins with a group of children celebrating the works of Seuss in the bouncy, memorable song “Oh, The Thinks You Can Think”. A little girl (Abigail Isom) is brought into the story as Jojo, the daughter of the Mayor of Whoville and his wife (Gary Glasgow, April Strelinger). The Whos live on a tiny planet contained in a speck of dust that is found by the earnest, dependable Horton (Stephen Wallem), who deposits the speck of dust on a clover and vows to keep it safe. Horton’s neighbors in the Jungle of Nool are very skeptical and, led by the confrontational Sour Kangaroo (Liz Mikel), question his discovery. Meanwhile in Whoville, Jojo is questioned by her parents and the other townspeople because her imagination is too vivid, so she’s sent to a military school led by the loudly belligerent General Genghis Khan Schmitz (James Anthony), in order to teach her discipline. In the Jungle of Nool, insecure bird Gertrude McFuzz (Kirsten Wyatt) pines for Horton while the self-absorbed Mayzie La Bird (Julia Murney) flies off to enjoy a vacation while leaving Horton to sit on her egg. From there, the story unfolds in fantastical Seuss fashion, as Horton and Jojo struggle to find their place in their worlds and the Cat in the Hat guides the audience through the whole journey, as narrator, commentator and occasional participant. The first word that comes to my mind when thinking of this production is “colorful”. The design team, led by scenic designer Robert Mark Morgan and costume designer Leon Dobkowski, has certainly brought a whole lot of color to the Muny stage, inspired by Seuss’s style but not directly copying it, especially in the costumes. The stage is set up like a storybook wonderland, with a giant open book at center and surrounded by several giant-sized Dr. Seuss books with familiar titles such as Green Eggs and Ham, The Cat In the Hat, Horton Hears a Who, etc. The books and scenery are painted in a rainbow of bright colors, as are the inventive, simply styled costumes that suggest the characters rather than literally representing them. The birds, for instance, wear bright dresses with fluffy skirts, and many other characters are wearing brightly colored outfits with earpieces and/or tails or, in the case of Horton, a trunk to distinguish their species. The Whos are similarly colorful, and General Schmitz is decked out in garish purple camouflage. It’s a visual feast, and fitting for the bright, imaginative tone of the musical itself. 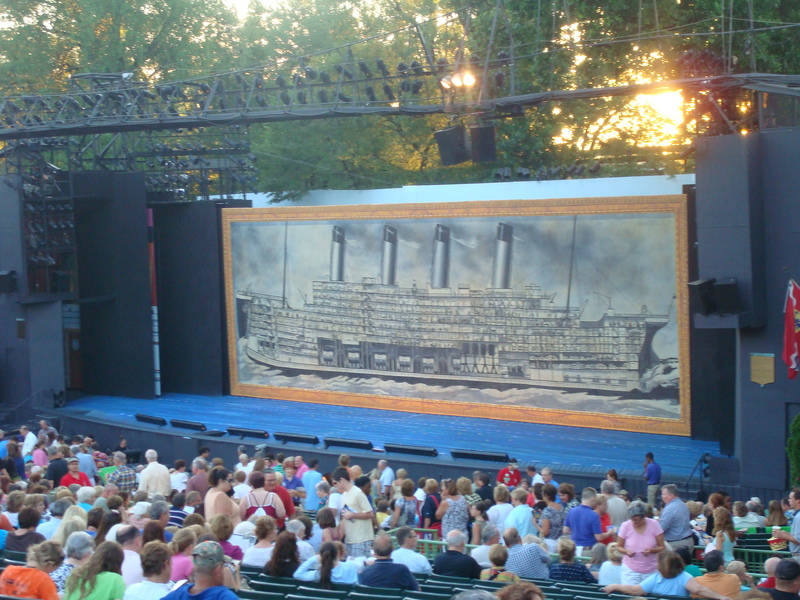 The staging is also well imagined, using every inch of the Muny stage, and even involving the audience in some fun moments such as bouncing beach balls around and following the Cat as he wanders throughout the audience followed by his “news camera” on various occasions, including a fun Muny in-joke referencing Tartaglia’s last appearance at the Muny in Aladdin. Aside from the Cat and a few other more energetic moments, the show is mostly paced more gently and a lot less madcap than I had expected. It’s a kids’ show first and foremost, and the staging makes that clear. Performance-wise, the cast is in excellent form, with strong performances all around, supported with much enthusiasm by the Muny’s Youth Chorus. Tartaglia brings a great deal of charm to the role of the Cat, serving as an ideal tour guide through the production, and playing various other characters as needed along the way. He’s not nearly as over-the-top as he was as the Genie in Aladdin, although that is fitting for the more gentle tone of this production, and he leads the production with style from start to finish. Wallem is appropriately earnest and likable as Horton, and Isom turns in an especially impressive performance as the imaginative, determined Jojo, with a strong, clear voice and great stage presence. Her duet with Wallem on “Alone In the Universe” is a memorable moment. Wyatt is also very strong as the quirky, lovesick Gertrude, and Murney has some great moments as the impossibly vain Mayzie. Anthony as the stubborn General Schmitz is also a stand-out, bringing a lot of energy to his song about “The Military” and leading his army (and the reluctant Jojo) into a ridiculous and futile battle using “Green Eggs and Ham” as a marching chant. Mikel also makes a strong impression as the bold, contrary Sour Kangaroo, and the ensemble seems to be enjoying every minute on stage. There are several sweet moments in this show, such as the bouncy, recurring “Oh, The Thinks You Can Think” theme and the lullaby “Solla Sollew”, and even some wit and irony in the many reprises of “How Lucky You Are”. There are a few moments here and there of humor and themes that adults will be able to appreciate more than kids, although everything is primarily geared toward the children. I brought my 14-year-old son to this show, and he agreed that this production is probably best appreciated by kids a few years younger. I think it’s most suited for kids ages 5-10, as well as anyone with a particular appreciation or nostalgia for Dr. Seuss’s stories. It’s all very sweet, charming and colorful, with a strong cast and a very Seuss-esque aesthetic, although it isn’t quite as crazy or energetic as I had hoped. With a valuable message that encourages imagination and acceptance, and a catchy, memorable score, Seussical is definitely a worthwhile production especially for the very young. Lock the doors, board up the windows and make sure you know where everyone is (and who’s on your side). There are some fearsome creatures out there, and you don’t want them to get you, but it turns out that the threats from inside might be just as insidious as those outside. That’s the premise for Night of the Living Dead, the musical adaptation of George Romero’s famous 1968 film, presented by New Line Theatre with all the boldness and energy that New Line is known for. In the hands of New Line’s excellent cast and creative team, it’s a thoroughly compelling and riveting production. I have to admit that I’m a wimp when it comes to horror films, and I had never seen the film of Night of the Living Dead before attending this production, so I didn’t know exactly what to expect. I guess I was expecting a stage full of shambling undead creatures along with blood, guts, gore and lots of sheer terror. Well, the “sheer terror” part is right (in places), and the story does involve zombies, but pretty much everything else I had assumed was wrong. What I saw was an old-fashioned suspense thriller that just just happens to revolve around a zombie invasion. 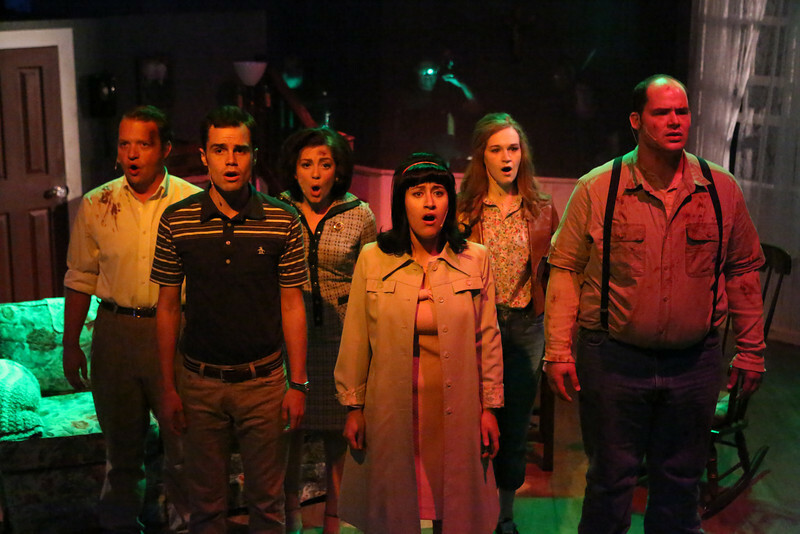 In the ominous opening number, “Perfect”, the various cast members recount the day, which started out very promising and then descended into the apocalyptic despair and desperation that begins the action, as Ben (Zachary Allen Farmer) arrives at the house to find Barbra (Marcy Wiegert) in a semi-catatonic state and unable to adequately communicate how she got there or much else. In the midst of trying to board up the house, they also encounter the paranoid, bullish Harry ((Mike Dowdy) and his exasperated wife Helen (Sarah Porter), as well as naive young sweethearts Tom (Joseph McAnulty) and Judy (Mary Beth Black). Together, these very different people must learn to work toward a common goal–protecting against “those things” out there (the show never uses the word “zombie”) and trying to find a way to escape. The events progress in a slow, deliberate way as the personalities clash, theories and ideas are discussed, and the secrets of the house and its former owner are revealed, as occasional news broadcasts (ingeniously presented in a chant-like song and its reprises) reveal the escalating situation in the outside world. The actual zombies are shown very rarely, but when they do show up, it’s positively chilling. I did check out the film online after seeing this production, and I was surprised in how well this film was adapted for the stage instead of just trying to replicate the film. The stage version is much more in the vein of a psychological thriller, well crafted by writers Stephen Gregory Smith and Matt Conner so that the music adds to the building tension and reveals the characters’ stories. There is no dancing and no showy production numbers—everything serves the story, from the foreboding of the opening number, to Barbra’s haunting “Music Box” song, to the various character establishing songs such as “Drive” for Harry and Helen” and “This House, This Place” for Judy, and then ratcheting up the tension as the Broadcasts continue and the characters’ desperation builds. Barbra’s explosive “Johnny and Me”, where she finally tells her whole story, is an emotional breakdown in musical form, and “The Cellar” (reprise) from Helen is at once terrifying and powerfully sad. There are several truly terrifying moments that had me glued to my seat in fear, as well as moments of comic relief, brief hope and profound despair. The performances are excellent across the board, anchored by Farmer, who displays excellent stage presence and a strong voice as the determined, resourceful Ben. Wiegert was also outstanding as the traumatized and fragile Barbra. Dowdy makes a convincing antagonist as Harry, and his moments with Porter as Helen are charged with belligerent energy. 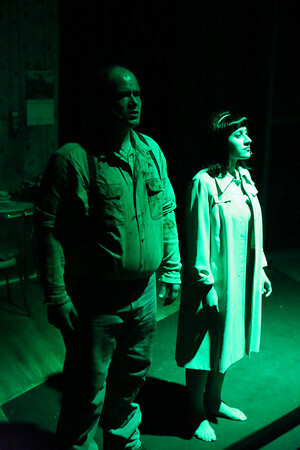 McAnulty and Black also work well together as Judy and Tom, and Black has probably the best singing voice in the show, shown to powerful effect in her solo song “This House, This Place”. The whole cast works together as a seamless unit, making all the relationships and conflicts believable and frighteningly intense. The production design, from the highly detailed set designed by Rob Lippert, to the period-appropriate costumes by Sarah Porter and Marcy Wiegert, to the outstanding lighting (also designed by Lippert), sets the mood, time and place extremely well. The late 1960s atmosphere was meticulously accurate, with great little touches like the portable television and period-specific radio, and also in the women’s hairstyles. It truly felt like 1968, or how I would imagine it to be, and that also added to the overall tone of an old-fashioned cinematic thriller. This isn’t the type of show I usually rush to see. I had been so impressed with the last show I saw at New Line, Next to Normal, that I was willing to give this show a chance despite my squeamishness about horror films, and I’m glad that I did. Yes, I was terrified, but that’s the point of a show like this, and wow, was it done right! I was literally shaking in my seat, and the sense of terror was palpable in the audience. This is an old-fashioned suspense thriller in the very best sense. Kudos to New Line for scaring me out of my wits and showing me that a horror show well done can be an evening well spent. The Muny is a St. Louis tradition that is somewhat hard to explain to people who haven’t been there. In one way, it’s easy—it’s an outdoor theatre that shows seven large-scale musicals every summer, and they do a lot of their casting in New York, which means that many of the performers are Broadway and touring veterans, from Tony winners like Randy Graff (Hello Dolly, 2006), to touring favorites like Eric Kunze (who has been in several Muny productions and who stars as Joe Hardy in Damn Yankees this year), and rising stars like 2010 Tony nominee Kate Baldwin, who has been in five shows at the Muny—most recently last year when she played Marian in The Music Man. They usually put on well-known, crowd-pleasing shows that draw thousands every year to their large outdoor venue in Forest Park, just a few blocks from our house. That’s the easy part to explain. The hard part to describe is the whole atmosphere of the place, which is a large part of what makes it such a beloved St. Louis institution despite its drawbacks (which I will also try to explain). The Muny is an experience. It’s not just about going to a show. It’s about going to a show with a picnic dinner and sitting in the grass surrounded by hundreds of others before the show, taking in the live pre-show entertainment provided by various local acts. It’s also about lining up for ice cream and popcorn at the concession stands, and sitting down in the huge stadium-like outdoor auditorium while huge fans buzz overhead on hot days before the show. It’s also about rising for the National Anthem before the show like at a baseball game, but unlike at most sporting events, the vast majority of the thousands of people in attendance actually sing—at the top of their lungs. It’s also about watching possums run back and forth in the lighting rigs, sometimes during the show. And because it’s outdoors and the stage is so huge, it’s about special features like an actual helicopter flying over for Miss Saigon (2008), and real fireworks at the end of Meet Me in St. Louis (2004). The stage is so big that colossal productions like Les Miserables (2007) actually have to have larger casts than Broadway. Also, the outdoor setting and the stage backed by real trees adds an interesting element to the sets. And then, there are the free seats in the back, which have an atmosphere of their own. I mentioned drawbacks, and there are a few. First, the schedule tends to get repetitive. There are certain shows (like Cats, Annie, My Fair Lady, and The Sound of Music) that seem to be on a perpetual five year cycle. If you go to the Muny long enough you are guaranteed to see many repeated shows. My family and I moved to St. Louis in 2004, and we’ve already seen them repeat quite a few shows, like The Music Man, Meet Me in St. Louis and Annie, and this year they have already repeated Beauty and the Beast, and will be repeating The Sound of Music and Cats. Next year’s season is bound to bring a few more repeats from the previous 5-6 years, as well. There are classic shows such as Carousel that have not been performed at the Muny in over 20 years, because the Muny has a voting system. Every year they pass out surveys and the audience members vote for the shows they want to see. This results in many repeats and a few debuts of newer favorites like The Producers (2008) and Hairspray (last year), but also often results in some well-known classics being overlooked and more obscure shows being ignored, with occasional exceptions such the the excellent 2007 production of The Pajama Game, which hadn’t been performed at the Muny since 1968. This also often precludes productions of some of the edgier or grittier shows like Sweeney Todd and Rent. Still, despite the drawbacks, the Muny is well-loved fixture of summers in St. Louis, and we always try to see at least some of the shows every year. This year, we plan on seeing Titanic, Damn Yankees and Show Boat. We have seen some first-rate productions, as well as some less-than-great ones, but it’s always an experience, and it’s one you can only get in St. Louis. So, for many years many people have told me “Michelle, you should start a blog”, because I like to write, and I guess people think I’m good at it. I also love theatre, both musical and non-musical, and I’ve always thought it would be fun to write a blog about the shows I see, as well as my general thoughts about theatre. Well, at long last, here it is! 1. “Snoop” comes from a name I have used on various message boards for many years. The “Snoop” part does not come from the rapper (Snoop Dogg), but from Snoopy, the Peanuts comic strip dog, because I’ve loved Snoopy for as long as I can remember. It has gotten to the point where several of my online friends just call me “Snoop” instead of my real name, so I figured I should carry it over to this blog, because it’s fun. 2. As the blog title says, I do not claim to be an expert in theatre. The closest thing to formal training I have is four years of drama class in high school, and one playwriting class in college. I have a smattering of experience in various areas of amateur theatre, but mostly I’m just an avid fan. I love to see plays, and I love to read, talk and write about plays and performers. 3. The opinions expressed in this blog are my own, based on my years of being a major theatre geek. The level of my geekdom has waxed and waned over the years, but it’s in full swing right now and I’m excited to finally get this blog going so I can have an outlet for my thoughts. 4. I will try to write reviews of all the shows I see, whether in St. Louis or elsewhere. I will also be sharing my opinions on various theatre-related topics, and maybe a few other random things as well–but mostly having to do with theatre in some way. 5. My interests run the gamut from high-brow to low-brow to everything in between. From Shakespeare and Sondheim to Andrew Lloyd Webber to original shows thrown together by a bunch of college students (see A Very Potter Musical, below). I do not like everything (Cats and High School Musical, this means you), but I like things of all levels, both well-known and obscure, and I always love discovering new shows and performers. There. I think that’s it. So, this is my blog, for better or worse. Whoever reads it, I hope you enjoy!